With the whole of Neopia being taken over once again by the spirit and fun that is the Altador Cup, I’m sure we will all do different activities during the AC whether it be watching and cheering the teams with family like I do or catching a slushie or making some noise with that crazy Techo fan, or just lounging on the beach doing nothing, but no matter what, you cannot escape the madness of the AC. Now it may all seem like fun and games, but is it, or is there a darker side to the AC? Now, you’ve probably got to the point now where you are just completely clueless and wondering what Carlisle and I are talking about when we refer to the dangers of Yooyuball, so here I go explaining some of the hazards of the great game. First, I will be looking at the dangers of playing Yooyuball. Now, to the normal eye, Yooyuball looks like a very nice and simple game, but deep down, it is probably the most dangerous game in the whole of Neopia. I completely respect the players for going out there onto the field and playing that game. If it were me, I would just be a plain chicken and run away while I still had my life intact. If you are a keen Yooyuball fan, you will probably know that there are seven types of Yooyus that are given out at random for the players to play with, but each one of these Yooyus has hidden dangers. Most of the time, the Normal Yooyu is the most common one for players to get. This sweet little Yooyu behaves completely normally and it is always good. Sadly though, it can become a hazard in the hands of the players. My brother, Tommy, was out watching a game with his friend, Kacheeky, and the player was aiming at the goal and aimed a little too high and the Yooyu went flying towards the fans at full speed. Tommy tried to stop it, but he is a ghost, so it went straight through him and hit poor Kacheeky straight in the face. He was rushed straight to the hospital and he needed stitches. I have just one word for this: OUCH! I mean, how painful must it be to get hit in the face at full speed! The next Yooyu is the Fire Yooyu, which as you can tell by the name is quite fiery and super hot. Players must move this Yooyu around really fast to avoid getting burned, but sometimes they are too slow and do get their hands burned. Painful. Some teams such as Lost Desert and Mystery Island can take the heat, but others can’t. Let’s just hope that Yooyu never gets accidentally chucked into the stands or Altador may have to build a new colosseum. This Yooyu has burned things before, including Terror Mountain’s Right Defender, Rinok Fitel’s pants (boy, was that an embarrassing incident) and occasionally the goal nets. On the opposite hand to the Fire Yooyu is the Snow Yooyu. This Yooyu is extremely icy and its cold aura pierces the bodies of many players apart from teams such as Terror Mountain and Kreludor who are used to cold weather. Due to it being so cold, it is quite a slow Yooyu to pass around and if kept too long, it can give the players things such as ice burn. There was once an incident where a bunch of Snow Yooyus escaped onto the field and the entire field was turned into an ice rink, which caused Mystery Island’s Left Forward, Teylor Nix, to slip over and break his leg and getting him rushed to hospital. It took about three days to defrost the whole field so matches could continue. Like the Normal Yooyu, the Faerie Yooyu is quite sweet and cuddly and is one of the nicest Yooyus around, but unfortunately this Yooyu also has a hidden danger. This Yooyu is constantly emitting faerie dust, which is perfectly fine and harmless unless you get it in your eyes, because then it really stings like mad. This happened to Altador’s Right Defender, Timu, which left her blind for several hours. Even after the blindness, the faerie dust has some weird hypnotic effect which caused her to see rainbows, novas and flying Meepits for a couple of days afterwards. The Darigan Yooyu is probably one of the worst Yooyus around. These little troublemakers are known for not following the players and are quite devious and like to play practical jokes on people. Sometimes these jokes can be completely harmless, other times just downright dangerous. Also, the Darigan Yooyus have been known to have quite a temper and occasionally have turned on players and viciously attacked them. The Mutant Yooyu is quite a mysterious Yooyu. It can take on many characteristics of other Yooyus such as Fire, Snow, Faerie and Darigan, so it is completely random in its movement, which to a degree can be quite a hazard. The danger of this Yooyu, though, is its appearance. I mean, look at it; it’s got spikes all over it. How excruciating must it be to pass that around. It must be like throwing a cactus around. The last Yooyu, I would say, is probably the most dangerous to handle and has caused a lot of injuries in the game. I’m talking about the Clockwork Yooyu. 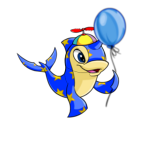 This little Yooyu may look friendly, but he explodes if not placed in the goal within the few seconds he is released, so players must try and get him in the goal immediately. If not, he explodes as you can imagine with some force, which completely wrecks the fields, injuries any players nearby, and chucks debris into the stands if close enough, which of course can hurt the fans. This is how Haunted Woods’s former Centre Defender, Autrey Fulse lost his life and became a ghost. So those are all the dangers of the Yooyus covered, but please don’t be under the illusion that it is just the Yooyus which make Yooyuball dangerous, because it is not. The players also play a major role in making the game hazardous. Tackling is what causes the most injuries in players. It’s okay if you get tackled by someone like Mystery Island’s Centre Forward, Bertie Shurtz, because it wouldn’t hurt due to her being slim, but if you had someone like Roo Island’s Right Defender, Gordo Gunnels, or Brightvale’s Left Forward, Kayn Hireck, coming towards you, you would be pretty scared, because those guys are big. I mean, seriously, they have been spending too much time hanging out at Hubert’s Hot Dogs! In last year’s AC, Faerieland’s Left Defender, Delma Harrence had some serious damage done to her tail when she was tackled badly by Maraqua’s Centre Defender, Oten Runeu. Also, I know many teams stick to the rules and play fair, although there are a few teams which do not do this and cheat and play completely dirty to win, not that I am naming any teams. *cough* Some teams are quite crafty in their methods of play, but some carry out completely safe craftiness where others carry out real dangerous craftiness to get the upper hand. Another thing what makes Yooyuball dangerous is the timing of the Altador Cup. Summer is not really the best time to hold a game event such as the AC, as temperatures are usually super hot and many players lose their cool in the heat. Teams like Lost Desert and Mystery Island are fine, being used to the hot weather, but teams like Terror Mountain have real trouble playing and sometimes it will get so bad that players will faint on the actual field due to heat exhaustion. Yooyuball may be responsible for the majority of injuries caused, but the other games can be just as bad and wild. Slushie Slinger is no exception. My friends, China and Anesidora had gone down to the slushie bar to grab some slushies as it was super hot. As always in this hot weather, there was a queue. Anyway, five minutes later they were nearly at the counter, minding their own business, just chatting away when they were disturbed by a gang of three Skeiths who had pushed through everyone behind them and now wanted them to get out of the way so they could get to the counter. China and Anesidora didn’t let them, though, and before you knew it, it had sparked up into one big slushie brawl. There were slushies being thrown in every direction and everyone joined in from every team. So in the end, the gang got kicked out and I think every team lost points that day. Just proves that even the simplest and most relaxing games can go wrong. The main hazard of Slushie Slinger is basically that people waiting for slushies just get far too impatient and end up losing it. Make Some Noise also has a few dangers as my friends Valoo and Mortimer found out. They were going to a YYB match and luckily managed to get front row seats. The match started and they started to cheer for the teams as making some noise gets them some points. However, what they didn’t realise was that they were sitting next to the crazy Techo fan. No wonder the seats were so cheap. He started to scream his head off with full force, nearly deafening everyone nearby. Valoo tried to grab hold of him but fainted due to his massive headache, so Mortimer knocked him out cold using a flag. Real dangerous playing MSN, good chance you will go deaf. The AC should so start selling earmuffs; they would make so much profit. So, as you can see, there are many dangers whether it be playing Yooyuball, Slushie Slinger, Make Some Noise or just plain watching. The moral of this article is to not go out and buy safety gear, stay indoors and hide or go out and buy flame resistant pants, but to just have some common sense. Don’t cheat, relax and have fun, look after yourselves, don’t bash other teams (unless it’s light-hearted bashing), and beware of the dangers of the AC. On a last note, I wish all the teams good luck and I look forward to see some fantastic matches. GO MYSTERY ISLAND! A big thanks to Krystal, Heather, Leigh and Komori for letting me use your pets, makes this article more fun. Thanks to everyone that has supported me with this article.